superdumb supervillain: Elmer's Needs World-Changing Girls! If you know a girl between 11-24 who wants to change the world, read on for an amazing opportunity! 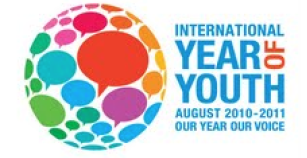 The 2011 International Year of Youth Culmination Celebration will take place on August 11th, 2011 at the United Nations Headquarters in New York City. 192 delegates from all over the country– one girl for each member of the UN General Assembly– will have the opportunity to speak out, change the world and be heard. The annual event is powered by AllyKatzz, an on-line community specifically designed as a safe social networking/blogging platform for teen/tween girls only. Elmer’s is a proud sponsor of this amazing summit! You might remember that I have had the opportunity to work with Elmer's several times and am a proud member of the Glue n' Glitter community on Collective Bias. Well, they have given the bloggers in our community a fantastic opportunity– THREE delegates will be selected directly from the Glue n' Glitter family, either young female relatives of our bloggers or our audience members! Do you know a girl who is interested in learning more about the eight millenium goals listed below that were adopted by the United Nations and in coming together with her peers to talk about ways to change them in the future? Please help us find those special world-changing girls! Click here for the application. Applicants must be registered on AllyKatzz and applications must be received by JUNE 30, 2011. In order to be considered for one of the three specially-designated delegate seats, she must answer the question "How did you hear about the Youth Celebration?" with “Elmer's Glue n' Glitter”. I wish Roo was old enough to participate in this opportunity. I'd love to hear about your nominees in the comments below! Disclosure: In accordance to the FTC Guidelines and WOMMA Code of Ethics, I am disclosing that I have a long-standing relationship with Elmer's but did not receive any compensation for writing this post. As usual, all opinions are entirely my own. My Boo is one year shy of it! She so badly wants to go - wish they would've had this when I was a kid! Wow, what an opportunity. I am about to pursue my master's in Social Work and this would be a great opportunity. I will definitely post it on my facebook and see if others would like to be involved. I have a lot of motivated young women as friends!